Microsoft is vigilant when it comes to adding features to the Windows operating system for the convenience of their users. Their goal is to make Windows as user-friendly as possible. One such element of convenience by Microsoft is the automatic connection to a known wireless network. Microsoft has this default auto-connect setting in Windows 7, 8 and 10 for Wi-Fi connections that you have used at least once. It connects your PC or device next time you are near the network. This information about the connection is saved in your PC’s network profile. If it is your home PC then an automatic connection to the Wi-Fi network makes sense as establishing a connection every time you turn your computer on at home is a waste of time and effort. However, for networks in public places like cafes, coffee shops, and restaurants, etc. this feature is a negative point. So, unless your PC has a strong firewall installed, avoid connecting to weak public connections as they are a prime target of hackers and other malicious individuals. You can manually disconnect your computer from such networks or disable the automatic connection for specific networks in Windows 7, 8 and 10. 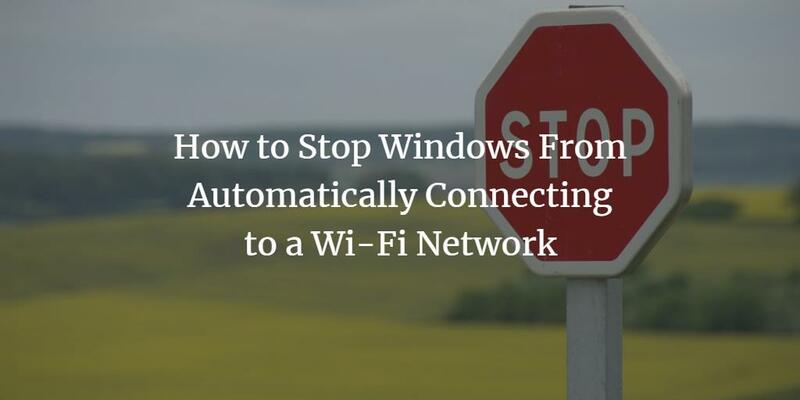 In this post, we will guide you step by step on how to stop your windows from automatically connecting to a Wi-Fi network. Step 1: Click on the Action Center icon located on the extreme right side of the taskbar. Step 2: Click on Expand and select ‘All Settings’. Step 3: Click on the ‘Network & Internet’ icon and select ‘Wi-Fi’ from the menu. Step 4: Choose ‘Change Adapter Options’ listed under ‘Related Settings’. A ‘Network Connections’ window will open. Step 5: Double-click on the Wi-Fi network you want to disable auto-connection with. Another window will open. Step 6: Click on the button with ‘Wireless Properties’ label and uncheck the option with ‘Connect automatically when this network is in range’ label. Step 7: Click ‘Ok’ and close all the windows. Step 1: Click on the icon for ‘Wireless Networking’ on your system tray or systray located on the right side of the Taskbar, next to the clock. The icon has 5 bars that increase in size from left to right. You can also use the ‘Charm’ utility for this. Click on ‘Settings’ and then select ‘Network’. Step 2: Locate the network you want to disable the list present and right-click on it to open a menu. Click on ‘Forget this network’ to permanently delete that particular Wi-Fi profile. Step 1: Click on the Start button and select the Control Panel option. Step 2: In the Control Panel, click on ‘Network and Internet’ and then choose ‘Network and Sharing Center’ from the right panel. Note: If you are using the icon view then directly click on Network and Sharing Center. Step 3: Select the option ‘Change Adapter Settings’ from the list displayed in the left panel. Step 4: Find the network that you want to disable for automatic connection and right-click on it and click on ‘Properties’. A dialog box with label ‘Connection Properties’ will open up. Step 5: Click on the ‘Authentication’ tab and uncheck the option ‘Remember my Credentials for this Connection Each Time I'm Logged On’. Step 6: Close all the opened dialog boxes and windows. So, this was our tutorial on how to disable the automatically connect to a wireless connection in Windows platform. Let us know your views on the automatic connection setting for wireless networks in the comments listed below.